"Its first name was Bethel..." so began the Reverend A. B. Fields in his centennial sermon of 1876. 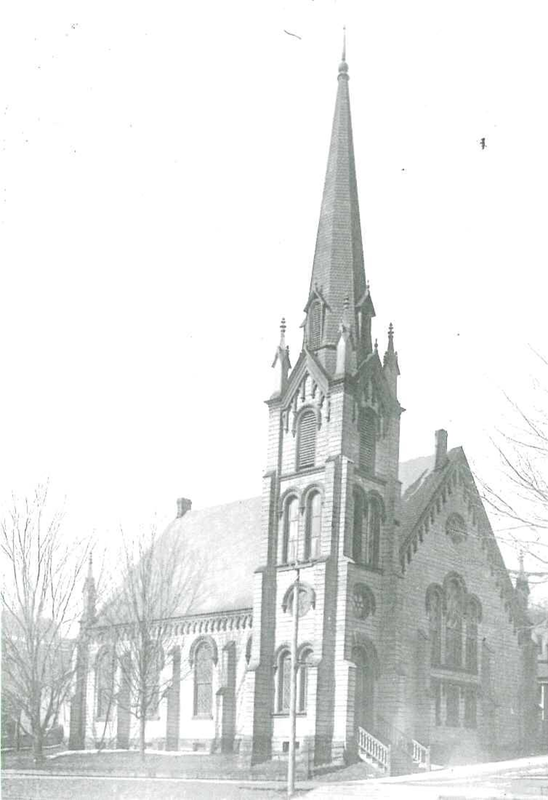 The congregation known today as the Presbyterian Church of Brookville traces its formal beginning to 1824. However, Presbyterian clergy were baptizing, marrying, preaching, and burying in Jefferson County more than a decade earlier. Meeting first in homes, then in a log schoolhouse near the Old Jefferson Cemetery on Route 23 and in a log church where Route 322 enters Union Township, the congregation moved into the county seat and a new building on the corner of Main and White Streets in 1842. Scot-Irish descendents continued to move into the area, encouraged by timber prospects, and the congregation grew. Following the Civil War but before the Depression of 1873, the congregation built a new building on the same location. Sermons were described as "strong, doctrinal, and yet with a tenderness of pleading that touched the hearts", and preachers as "effective" or "evangelistic". In 1884 Paul Darling's bequest made possible the construction of the French Second Empire manse adjacent to the present building (1905). worldwide by offering a wide variety of programs and activities for people of all ages. - 36 north into Brookville; Church is across from the traffic light to the right. intersection with Route 322 and go into town; at the traffic light at the bottom of the hill church will be on left corner. continue across bridge and up the hill into town; pass thru the second traffic light; the church is on the right corner at the third traffic light. Take Route 322 west to the traffic light at the bottom of the hill; go straight into downtown; at the second light, the church is on the right corner. light where the road intersects with Routes 28 and 36; go straight into town; at traffic light at the bottom of the hill; church is across street on the left corner. across the street on the left corner.